There’s a healthy chance the Warriors up and Do It. As things stand coming out of the All-Star break, the Warriors will probably catch Michael Jordan’s 1995-96 Bulls, which own the record of 72 wins, and are a little better than a coin flip to pass them. Last time we checked in on Golden State’s run to 73 was back in December, when the model gave the Warriors a 54 percent chance of getting at least 72 wins and a 44.1 percent chance of at least 73. A little more than two months later, the Warriors are 48-4 and those chances are 69.8 percent to hit 72 and an even 54 percent to reach 73. From where we sit, at least, the Warriors now appear likely to break the ’96 Bulls’ record. Our colleagues at ESPN Stats & Info once again have a less optimistic outlook, today giving the Warriors a 37 percent chance of hitting 73 or more wins. The explanation for the difference in the two models is the same as it was in December, when we were also more bullish than our colleagues: We devised a different rating system, called CARM-Elo, which allows good (or bad) runs of play in the simulations to inform a team’s simulated strength through the rest of the simulated season. Basically, this means that it allows for extreme performance to be reflected in the results, and the Warriors are certainly extreme. Still, all of the back-and-forth over exactly how good the Warriors are is more than a little backward. Any serious debate over whether Golden State is an all-time team dried up months ago; all that’s left now is the dreary accounting of decimal points next to the team’s name. Screw that. NBA nerds slapfighting over some grandiose meaning of the Warriors is boring — it’s the spectacle that matters, the crossovers and no-looks and nonsense transition threes, and how those feats of skill translate to the stat sheet. That in mind, here’s a bunch of Warriors facts aimed at appreciating the wild mess they’re accomplishing this season, rather than simply measuring it. The Warriors would have to miss their next 545 3-pointers to bring their team mark of 42.4 percent down to the level of the league-worst Lakers, at 31.5 percent. If the Warriors completely gave up the 3-pointer and shot none of them per game from this point forward, the Timberwolves, who take the fewest threes per game, would need 50 games to catch up in attempts and 83 games to catch up in makes, pulling even right around the 137th game of the season. In order to match the best 3-point-percentage season of Reggie Miller’s career (42.9 percent), Steph Curry (45.4 percent from three on 10.8 per game) would have to miss 31 straight threes; to match Larry Bird’s best (42.7 percent) he’d need to miss 34 straight; to match LeBron’s mark this season (27.4 percent) he would have to miss 354 straight 3-point shots. Curry’s 646 3-point attempts last season were more than those Miller and Bird seasons combined — and he’s on pace to demolish that number this year. Remember that two-month stretch in the summer of 2009 when Steph Curry might have gone to the Knicks, before Donnie Walsh and Mike D’Antoni went around telling anyone who would stand still long enough to hear it exactly why Curry would be a superstar? And remember how disappointing it was, then, when Curry landed on a Warriors team that didn’t use him at all in the way fans dreamed he might be used by the Pringles ‘stache? 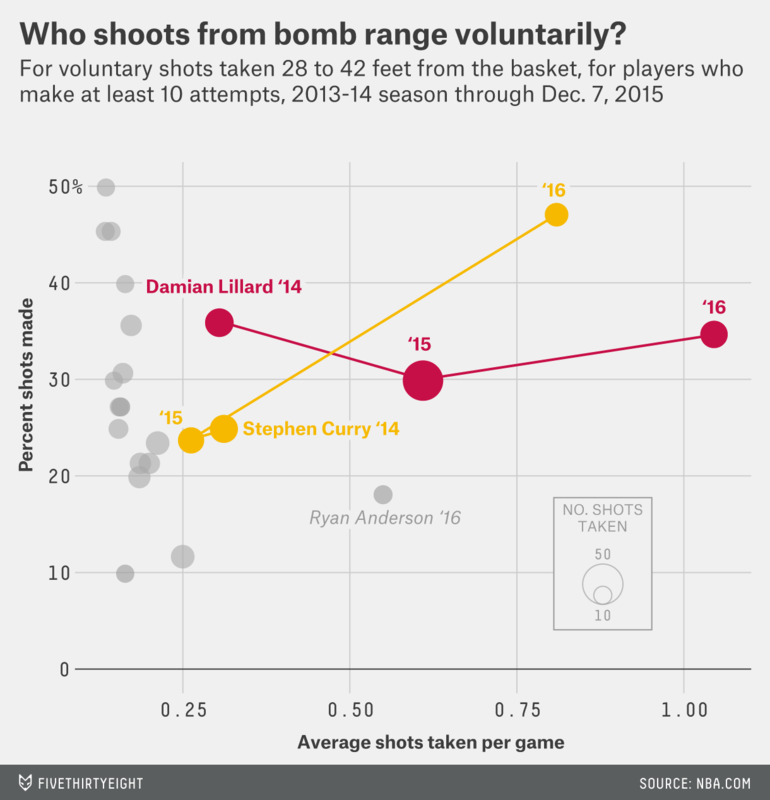 Well, Curry found his way into the seven-seconds-or-less offense anyway. By NBA.com’s count (which can lag a game or two behind), the Warriors have taken 299 threes in the first seven seconds of the shot clock and made 48.5 percent of them. The next closest by percentage is Indiana, at 42.5 on 167 attempts; Houston, first in attempts with 301 (in four more games than Golden State) has made 38.9 percent of its own; and the Thunder have found a way to make just 31.6 percent on 171 attempts. On all field goals in the seven-seconds-or-less window,1 the Warriors have a 68 percent effective field-goal percentage — the next closest is the Cavs, at 63.4 percent. The Knicks, meanwhile, are last in the league at 51.4 percent. The Warriors are shooting 46.3 percent from three on “wide open” (defender more than 6 feet away) threes, best in the league. They also lead the league in “open” threes at 41 percent and “tight” coverage threes at 37.3 percent. They do fall to fourth in “very tight” threes (36.1 percent) but have taken only 36 of those all season. Steph Curry is 11 for 24 on threes from 30 feet or more, according to nbawowy.com. Six of those shots (and one of the makes) were from beyond half court, meaning he’s 10 for 18 between 30 feet and the center line. (The rest of the Warriors are 1 for 14 from 30-plus.) 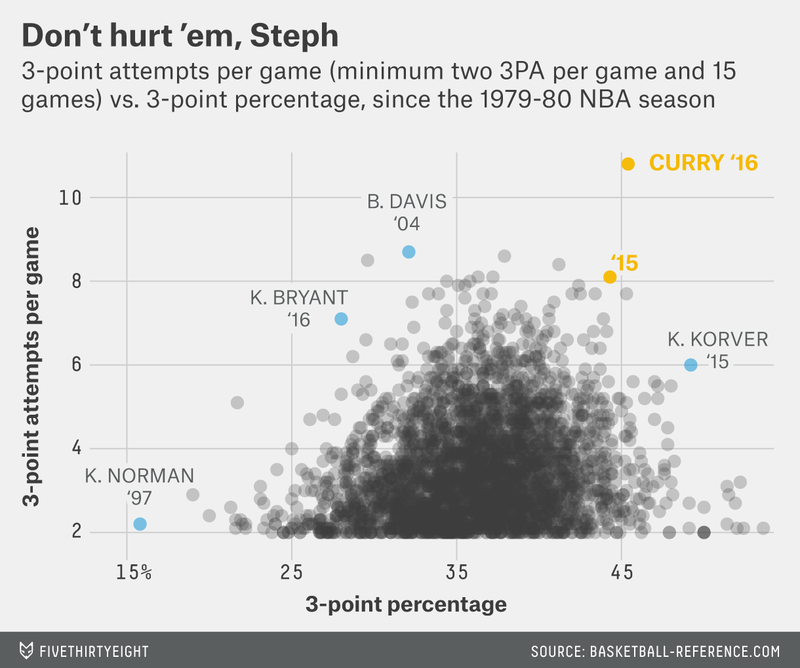 Consider this a reminder that Ben Morris dug into Steph’s imperious shot selection in December. The Warriors create 70.4 points per game through assists. The rest of the league has a fairly linear progression from the bottom on up — the Lakers are the worst, at 43.2, and the figure creeps up team by team until it stops with the Hawks, in second place, at 60.3. That isn’t adjusted for tempo (the Warriors play at the second-fastest pace in the league), but the Dubs are also comfortably in first in percentage of passes that are assists, are secondary assists or lead to free throws. Probably the most alarming thing about the Warriors this season is how thoroughly they are outpacing the Spurs, another omega-level team stalking around the league. Also according to nbaminer.com, the Warriors’ average first-quarter margin is +6.04. The Spurs are second at +2.98. The Spurs remain ahead of the Warriors on the overall marks, +12.7 to +12.5, but this difference is more than accounted for in the fourth quarter, where the Warriors are -0.12 and the Spurs are an NBA-best +2.56. The Warriors’ average margin per overtime period is +4.0, best in the league. And here’s the same display of possible records we generated for the Warriors above, but for the Spurs. Before Thursday night’s loss, the Spurs’ chance for 70 wins was 19.4 percent. With the loss, it fell to 8.9 — still absurdly high, but well back of the Warriors. Andrew Flowers and Jay Boice contributed research. NBA.com doesn’t have free-throw data for these, for some reason. Reggie Jackson is the only player to score 15 unanswered points this season. Only three players have done it since the 1996-7 season — Jackson this year, Jamal Crawford in 2013-14 and Brandon Jennings in 2012-13.